In front of 60,000 air show fans Chet Derby was performing stunts in a biplane. For the final stunt Derby was carrying out an upside down loop-the-loop, leaving a smoke trail which 3 B-29 Superfortresses were supposed to fly through. Derby was an accomplished pilot having trained countless Army Air Corp pilots. At the time he was a crop duster and flew air shows for extra cash. He would do all sorts of stunts including a wing-walker. 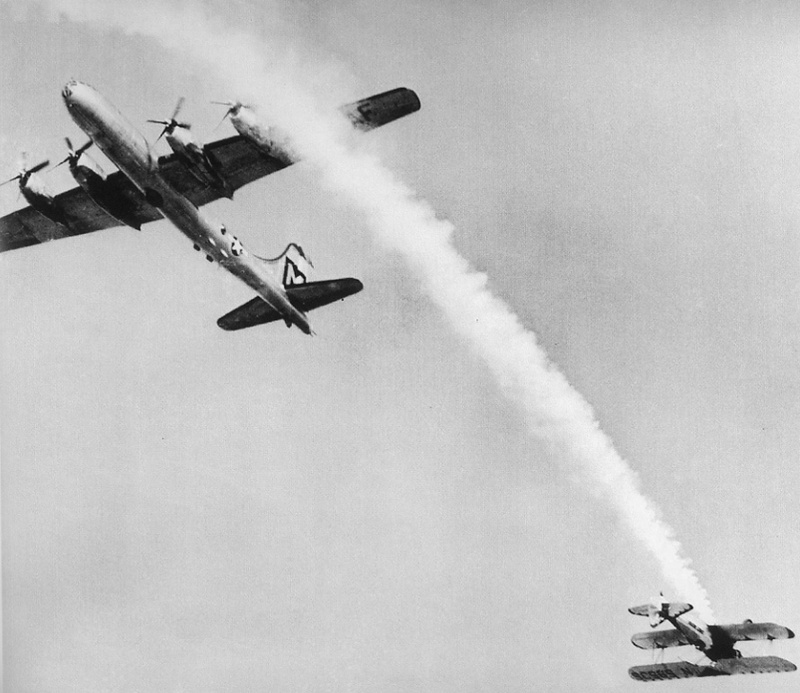 His stunt on that day came 5 feet (2 metres) shy of ending his life as the B-29’s came in too early. Bill Crouch was also a pilot and and an off duty attendee at the show. Crouch worked for The Oakland Tribune at the time and was taking pictures of the aerobatics. He was trying to get an artistic shot of the stunt plane Derby was flying. He thought the smoke circles against the blue sky were interesting and wanted to include the plane. Crouch composed the shot as best he could when the B-29’s came screaming across the sky with their four engines each roaring at full power. With little time to spare he recomposed and took the above shot as Derby flew upside down and missed the wing of a B-29 by 5 feet. The photo of the close call would be featured in Life Magazine and newspapers around the globe. That photo won Crouch the 1950 Pulitzer Prize and Derby a reputation as an ace stunt pilot. Derby would later say that the close call was not his closest. In a 1979 interview, he said that he was fortunate never to have had a bad accident.